Music is abstract. Music is intangible. Music is evanescent. Ever since the invention of music, the musician's goal of transmitting compositions from one generation to the next has been achieved through the practice of teaching songs to young students. In this way, musical compositions have been handed down through time, often unaltered but sometimes with changes, as the music incorporates elements from different teachers, styles and cultures. 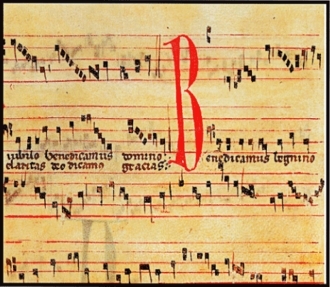 This method of transmission underwent its first revolution with Pope Gregory in the 8th century, with neume notation, or squiggly marks above the words of the music indicating the contour of the melody. This was the beginning of what we now call the musical score. The next development started in the 13th century, with a more accurate description of the actual note pitches, called mensural notation. By the 14th century, something like the present system of fixed note lengths arose. The next revolution is musical transmission came with the advent of audio recording technology, marked by Thomas Edison's invention of the phonograph in 1877. It was now possible to accurately and permanently document a performance, which meant that it could be re-performed at a future time by simply imitating the performance on the recording. A parallel development to the phonograph was the player piano. This utilized a perforated paper roll to encode the patterns of the stricking piano hammers. This has developed into the modern MIDI-controlled performance piano, and has a singular advantage over piano recordings: the sound comes from a real instrument, and not from a speaker. However, this technique is limited to musical instruments that have a mechanical nature, like pianos, organs and synthesizers, and involves the recording artist playing his performance on a specifically prepared instrument. Sensors record the motion of the keys as they are played, and these can later be reproduced identically to how they were played originally. Maybe one day we will be able to record the mechanical performance of an entire orchestra, as suggested by the fascinating Animusic videos.